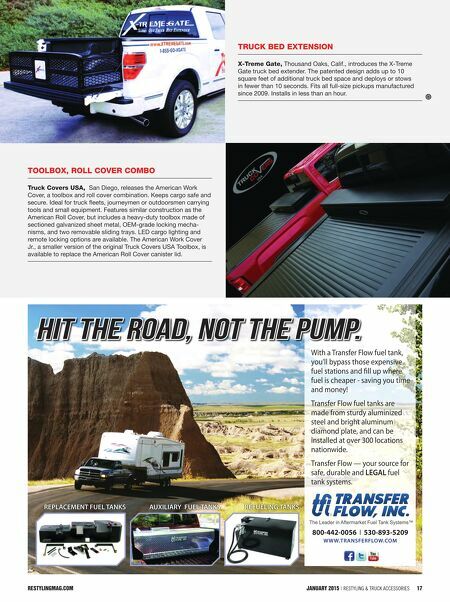 16 Restyling & tRuck AccessoRies | January 2015 restylingmag.com Tell them you saw their product in Restyling & Truck Accessories Magazine! Truck bike rack Swagman racks, Penticton, British Columbia, Canada, in- troduces the Patrol pickup bike rack. The design incorporates Swagman's Impakt Fork Mounts into a telescoping aluminum extrusion bar that is secured to the edges of the pickup box. It has two telescoping adjusters—both of which are lockable—as well as the two locking fork mounts, which are all keyed alike. The fork mounts are through-axle capable due to a series of interchangeable cores; 9mm, 15mm or 20mm. 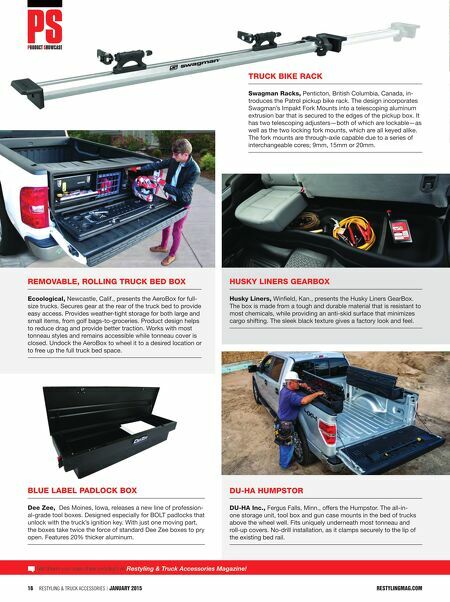 removable, rolling Truck bed box ecoological, Newcastle, Calif., presents the AeroBox for full- size trucks. Secures gear at the rear of the truck bed to provide easy access. Provides weather-tight storage for both large and small items, from golf bags-to-groceries. Product design helps to reduce drag and provide better traction. Works with most tonneau styles and remains accessible while tonneau cover is closed. Undock the AeroBox to wheel it to a desired location or to free up the full truck bed space. du-ha humpSTor du-ha inc., Fergus Falls, Minn., offers the Humpstor. The all-in- one storage unit, tool box and gun case mounts in the bed of trucks above the wheel well. Fits uniquely underneath most tonneau and roll-up covers. No-drill installation, as it clamps securely to the lip of the existing bed rail. huSky linerS gearbox husky liners, Winfield, Kan., presents the Husky Liners GearBox. The box is made from a tough and durable material that is resistant to most chemicals, while providing an anti-skid surface that minimizes cargo shifting. The sleek black texture gives a factory look and feel. blue label padlock box dee Zee, Des Moines, Iowa, releases a new line of profession- al-grade tool boxes. Designed especially for BOLT padlocks that unlock with the truck's ignition key. With just one moving part, the boxes take twice the force of standard Dee Zee boxes to pry open. Features 20% thicker aluminum.